The spring is the perfect season for getting married. The temperatures are just right, the scenery is picture-perfect, and the wedding fashion options are plentiful. When it comes to choosing wedding attire for the bridesmaids, narrowing down your options can be quite the task. Naturally, you want them to not only compliment the bride and groomsmen, but you’d like for your girls to be comfortable and free on your wedding day. We’ve put together some bridal fashion ideas from couples who have been married at our wedding venues in New Jersey. Who says you can’t add a little bling to your spring wedding? 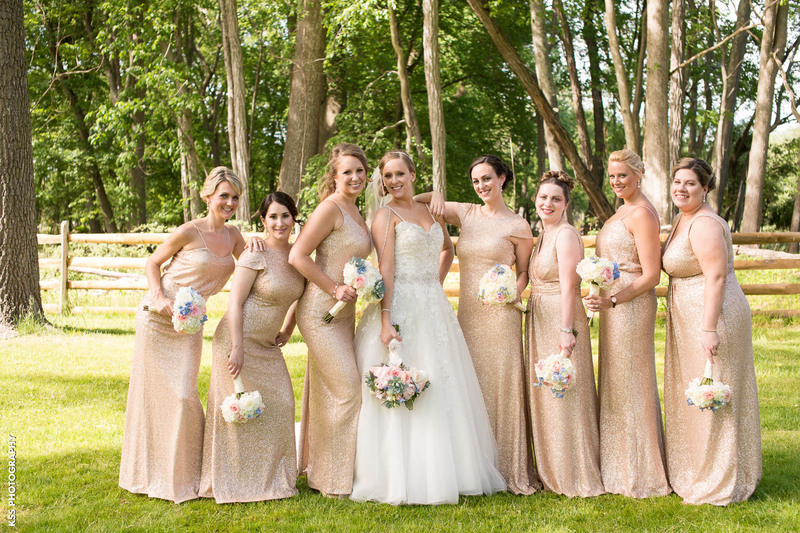 This bride opted for various bridesmaid dress styles in a soft shimmery rose gold. To add a touch of pastel, the bridesmaids are carrying gorgeous rose bouquets complete with soft hues of yellow, pink, and blue. Though the bride chose to keep it traditional, dressing in all white with a few embellishments, the bridesmaids added a burst of spring color by wearing long, flowing, lavender gowns. To tie in the springtime theme, the well-designed bouquets are a vibrant yellow and white. The bridesmaids all have on almost the same style dress here, but some girls tied their straps differently. The bride chose an elegant long gown with flowing material which fits all body types. 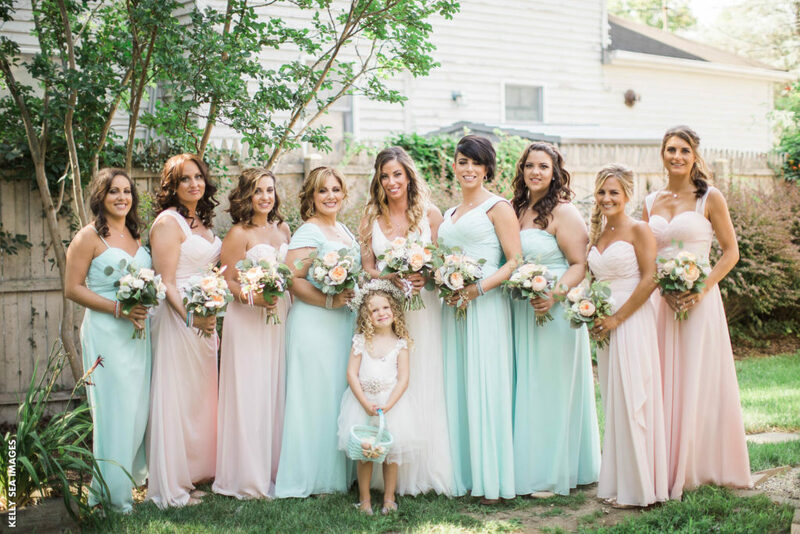 Incorporating two very popular spring colors, these bridesmaids look absolutely stunning in their soft blush and mint dresses. Allowing for a bit of personality here, you’ll notice how the dresses are similar in cut and material, but each has a unique twist to compliment each woman’s body type and style. When it comes to comfort for the bridesmaids, it’s always a good idea to give them a bit of freedom in choosing a dress style that suits them. 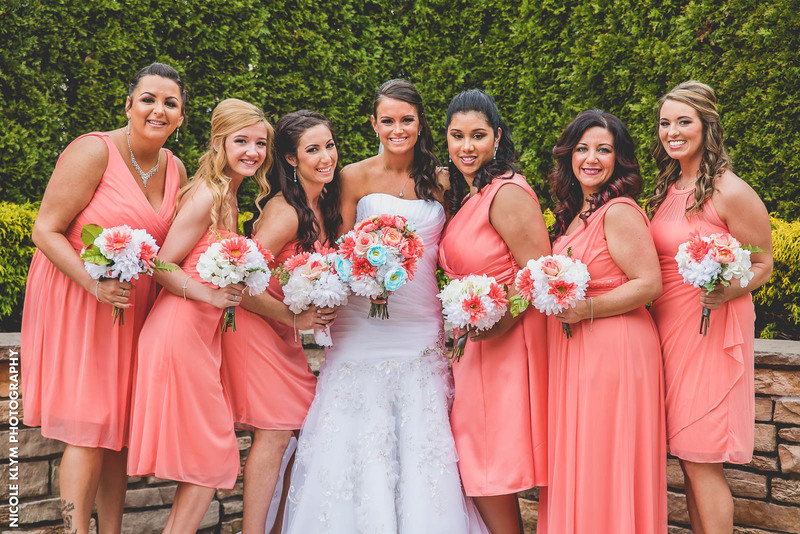 This bride chose a perfect color for spring, going with a coral rose. Adding a bit of flexibility for the bridal party, the girls have chosen various lengths and design of the dress. The white, pink, and blue bouquet are a nice touch for adding a burst of color to their spring wedding. When it comes to bridesmaids fashion for spring weddings, there are a lot of style options for you to pick from. As you choose the dresses best for your girls, make sure that you keep a few things in mind including color, type of material, body type, and comfort. Hopefully, this has given you some insight on options for your spring wedding that both you and your bridesmaids will be pleased with.